Liquidambar or sweet gum are deciduous trees grown for their alternate maple like leaves which take on brilliant and long lasting Autumn colour. This tree produces beautiful five pronged star shaped green leaves with creamy white margins and small inconspicuous flowers. The thick, deeply furrowed greyish brown tree trunk is another distinguishing feature of the Liquidambar tree. The sun loving Liquidambar tree is ideally planted alone, in splendid isolation and enjoys moist, well-drained soil. It does prefer normal/acidic soil, which can be achieved by adding Ericaceous compost ; a lime-free compost for acid-loving plants. The tree does not need regular pruning however a light trim removing any damaged branches will do no harm. This will keep the tree to a manageable size and ensure it stays looking magnificent. If planting trees staking is often needed, but it should be no higher than 60cm (2ft) above the ground. Tree Staking Advice. 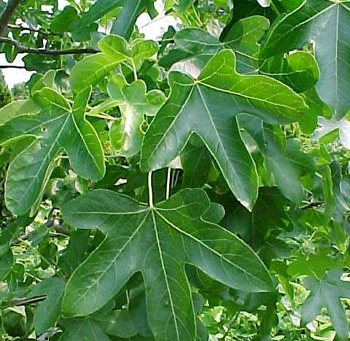 Liquidambar has over the years been used for medicinal purposes and was used as chewing gum by the Native Americans.